According to AAA, the monthly cost of owning and operating a sedan is approximately $700 a month. Protected bike lanes, freshly painted crosswalks and longer signals for people walking — these are just a few of the priorities Logan Square residents have championed during our project to improve walking and biking on Logan Blvd. 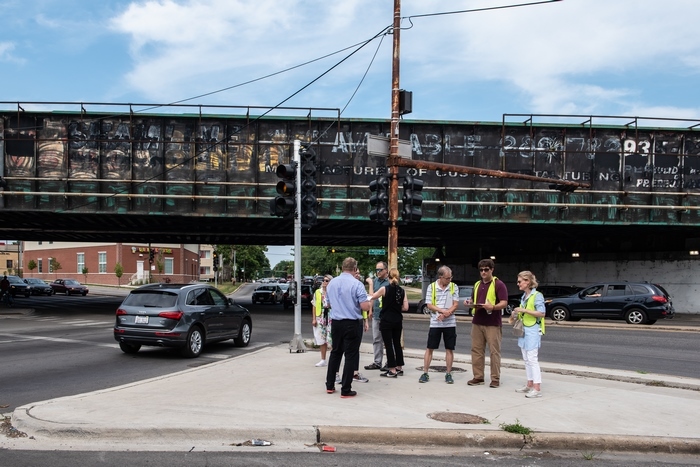 For the past eight months, the Active Transportation Alliance has led a variety of activities to identify the most significant obstacles to walking and biking on Logan from Rockwell St. to Lathrop Homes. This is a notoriously dangerous stretch for people who walk and bike on the Northwest Side. Western Ave. and the Kennedy Expressway overpass are both major barriers for people traveling east-west between Logan Square and the retail district surrounding Elston Ave. People traveling on bike and foot through this area must contend with high-speed car and truck traffic, poor lighting and visibility, and bike lanes and crosswalks that end abruptly. To build support for a new vision, Active Trans and local partners conducted a walk audit (see photo) and gathered input from residents who filled out more than 500 surveys at community events. We also provided presentions to neighborhood groups and published an online survey that generated nearly 1,100 responses. The following recommendations have strong support from residents and our advisory committee, a group comprised of twenty-five neighborhood organizations. Paint crosswalks in the study area to improve visibility of people walking and add a crosswalk on the south side of Logan at Western Ave. Improve pedestrian signals in the study area. None of the crossings have audible signals for the visually impaired; many countdown signals are too short for people with physical limitations. Add a protected bike lane to Logan west of Western Ave. to make it consistent with the lanes that exist on Logan between Western and Diversey. Fill in cracks in sidewalks and replace pieces of sidewalks that are missing. Consider adding shade trees and benches to improve the experience. Priority areas for these improvements: Leavitt and Diversey, Diversey and Logan, Logan and Western, and Western between Logan and Altgeld. Redesign stretches of Logan that are confusing and result in many preventable crashes. These include the highway underpass at Western and Logan, the entrance to Windy City Fieldhouse west of Target, and the two right turn lanes at Logan and Diversey. It’s important to keep in mind that improving walking and biking conditions results in safer roads for all transportation users, including people driving cars. Once a continuous Chicago River Trail comes to fruition, it’s crucial the city create safe east-west connections between Logan Square and the river, encouraging more people to walk and bike for everyday transportation. The growing density in the neighborhood also means that more people will need active options for getting around. Feedback from the nearly 1,100 people who took our online survey demonstrates that making these improvements would create many benefits. More than 80 percent of respondents say they would use an improved Logan to connect to a Chicago River Trail, and more than 70 percent would use it to shop in the commercial area, exercise for health and well-being, and protect the environment by driving less. Stay tuned for the release of our full report on Logan Blvd. to Lathrop improvements in September. Join the movement for a safer Logan Blvd. by signing up as an advocacy supporter.